Monday was a rainy day in Kansas City which meant FC Kansas City training was moved to an indoor location. That would have meant a longer drive for Jen Buczkowski, and she was just fine not having to worry about it. The end of the week might be different. Buczkowski won’t be on the plane to Boston, and she won’t be in the lineup for Sunday night’s match against the Breakers. And it’s the game nights she will miss most of all. There could hardly be a more appropriate answer to give for a player who made being part of game nights famous. After all, when the national anthem plays Sunday at Jordan Field, it will be the first time FC Kansas City ever line up for a competitive match without Buczkowski in the lineup. Before stepping away to focus on physical therapy school Buczkowski started all 71 regular season matches in FC Kansas City history plus five playoff matches. 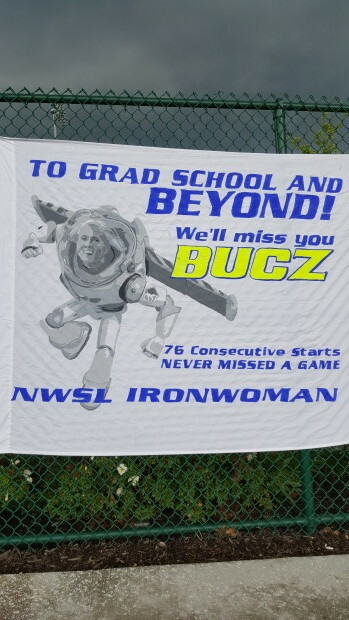 Not only did Buczkowski show up to play every week, she showed up to play well, and more often than not she won. Here is a quick rundown of Jen Buczkowski as a winner. At Notre Dame she was part of the national championship team in 2004 and national runner-up in 2006. At the youth national level she was part of the 2005 Nordic Cup winning U-21 side when, not surprisingly, she played every minute of the tournament. As a professional she played seven seasons before this one, reaching the playoffs every time with three championships from six finals. Waldrum recalled days on the training field when Buczkowski would get fouled by teammates and he would intentionally let the play carry on instead of blowing his whistle. Inevitably it was only a matter of time before “Bucz” as she was already known, would find a way to stick it back at the offending player. “You could just see inside her getting really pissed off and you knew it was coming,” Waldrum said. “It was just a matter of when she was going to go back and break that player or send her flying. She wouldn’t say anything, but kind of under her breath you knew she was waiting for that next opportunity. Buczkowski graduated from Notre Dame during the wilderness period for women’s soccer between the end of WUSA and the start of WPS. When the latter got off the ground in 2009 Sky Blue FC made her the 39th overall pick in the general entry draft. She was used accordingly as an extra piece in midfield and sometimes on defense. And then came the European Championship that called center back Anita Asante away from the club to play for England. It almost meant nothing when Sky Blue lost the final games of the season to the Washington Freedom. But the next day the Breakers squandered their opportunity, losing to the Los Angeles Sol and gifting Sky Blue a playoff berth. The playoffs that year were set up so that the fourth place team had to win three road games in a week to win the championship. That team was Sky Blue and the path began in Washington with St. Louis and Los Angeles down the line if they could produce upsets. Sky Blue won all three games with Buczkowski at central defense to win the WPS Championship. But that was hardly the oddest thing about the championship. The team’s first coach, Ian Sawyers, was fired in May for inappropriate contact. His replacement, Kelly Lindsey, abruptly walked off the job just as a practice was starting and with two games to go in the season. Christie Rampone, who would be Buczkowski’s center back partner in the playoff run, took over as player-coach. She was also pregnant, a fact she hid from her teammates until refusing to take celebratory champagne after the final. Riley added that the playoff run and particularly the final, is what opened his and Independence general manager Terry Foley’s eyes to what Buczkowski could become. Six years later he is still amazed she was available in what was essentially a draft of the least wanted players in the league. The Independence played two seasons and reached the WPS final both times. Buczkowski said going to Philadelphia and playing for Riley represented a turning point in her career. “A lot of who I became and the player that I am today, I owe a lot of that to Paul and the confidence he showed in me. He kind of shaped me into this role of the player that I am. At Notre Dame I played more of attacking spot. It wasn’t really until I got in with Paul in Philly that I was a true defensive midfielder. After two seasons in Philadelphia the team dissolved along with WPS. Buczkowski spent 2012 playing for the Chicago Red Stars entry in WPSL Elite. They went to the final and were a Toni Pressley 40-yard blast at the stroke of full-time from winning the title before going down in penalties. 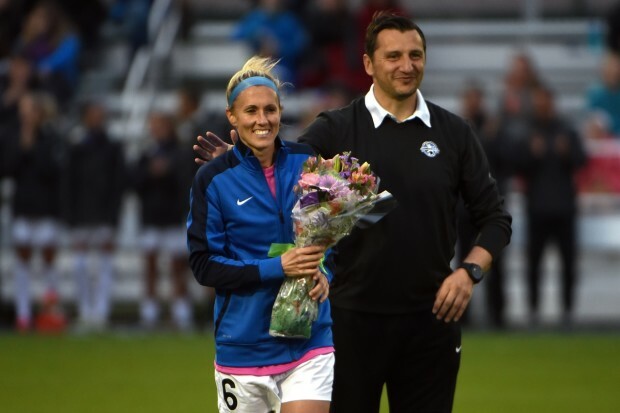 NWSL was announced soon thereafter and Buczkowski immediately became one of the most coveted players. So how did she end up in Kansas City? By all accounts, FCKC were the red-headed stepchild among the founding clubs. With their corny “Blues” moniker, an unknown ownership group and a foreign coach who made his bones at the indoor game, FC Kansas City started with little to no Q-rating. Buczkowski thought about staying in Chicago where she is from. But the Red Stars had Shannon Boxx and Keelin Winters and it likely was never going to be a good fit. And Riley was behind the scenes pulling some strings for FC Kansas City. Early on though, Buczkowski wasn’t so sure. Not when pre-season two-a-days meant afternoons spent running around a track to build fitness. Riley is known as a fitness fanatic, but Andonovski was taking things to a new level. The ultimate proof came in FC Kansas City being the only team to reach the playoffs in each of the first three NWSL seasons, the last two of which culminated with NWSL Championships. And Andonovski has backed off in terms of spending preseason afternoons at a track. Now 31, Buczkowski is looking for something a bit more stable financially than NWSL and she wants to get her next career—in physical therapy—off the ground. The first part won’t come immediately as she will have to get by on coaching income during three years of school. She will do it all in Kansas City where she has laid down roots. Philadelphia, she said, made her as a player. Kansas City made her as a person. If there is one thing she did not do as a soccer player, it is to get a chance to represent her country at the senior level. Though she was often recognized by insiders as among the best players at her position in whatever league was running at the time, at no point was she ever so much as invited to a camp. So what does Buczkowski think about never getting a call-up? “Ultimately I think the league should provide an opportunity for players. Not necessarily just myself but anyone who has a successful season should have an opportunity. It’s not specifically about me but you should call a player into a camp or two and see if they have it. If not then you move on to the next person. I think there is a lot of consistency at the national team and the league should provide a little bit more of in-flow of players to see who’s capable of playing at the next level and who’s not. It’s not just about me, I think there’s a lot of other players that probably deserved a chance. That answer is a microcosm of Jen Buczkowski the player and person, underselling herself but with a subtle message that maybe the system needs some tweaking. And somewhere in that response is the young, Notre Dame midfielder Waldrum spoke about. That player who was just waiting for the opportunity to prove herself, if only it had come along. Here are the attendance numbers for NWSL Week 5 plus season totals with comparisons to the same number of home dates in 2015. LAULETTA: Home schedule resumes this weekend so we’ll see where the trends take us. LAULETTA: I almost went on record predicting the second game would be the lowest of the season and I would have been wrong. But it’s quite a day when 7,841 is the lowest number of the season and we get to complain about it. LAULETTA: Solid opening two matches and the team is fun to watch. LAULETTA: Best attendance story of 2016. The Reign now lead the non-MLS teams, are dominating last year’s pace and have seen their season ticket base grow exponentially. LAULETTA: It’s a shame more folks didn’t turn out for Jen Buczkowski’s last game but it was the fourth home game in five weeks and on a Friday night. They could probably use a little breathing room. LAULETTA: They will need a big summer jump to finish 2016 ahead of 2015 but the early numbers being up is encouraging and the crowds have seemed lively. LAULETTA: There are several reasons to be impressed, especially with the 3,622 for the Red Stars match. It was the third straight home game and came right after the Thorns and the team is neither performing nor scoring. Still think the fan base in Boston is NWSL’s diamond in the rough. LAULETTA: Encouraging opener despite the poor weather. LAULETTA: Sales are double what they were compared to a year ago. -Jen Buczkowski’s stream will end at 71 straight starts plus five more in the playoffs. Christine Nairn stands to inherit the top active stream. Saturday night was Nairn’s 44th straight regular season appearance. -Lianne Sanderson returned to England earlier this week for a meeting with British Prime Minister, David Cameron. She will return in time to travel with the Pride for Friday’s match in Houston. -The Red Stars joined Sky Blue FC and FC Kansas City as the only teams to record four straight clean sheets. They have not conceded a goal in 396 minutes. Sky Blue holds the record having kept opponents of the board for 435 minutes between May 11 and June 1, 2013. -Alyssa Naeher has been in goal for all four shutouts. The league record is six by Nicole Barnhart. -On the flipside the Breakers extended league records by losing their first five games of the season and being shutout in all five. Including last season, they are the first team ever to be blanked in six consecutive matches. Their minute streak is at 542 minutes. The league record is 543 by the Washington Spirit. Because of the way soccer math works the Breakers will tie that mark as soon as Sunday’s match kicks off and break it after one minute goes by. The Spirit streak, set in 2013, ended against FC Kansas City. -Sky Blue released Caroline Casey to make room for Erin Nayler, who dressed as the backup on Friday. -Paul Riley said he has not decided on who will play central defense with Abby Erceg suspended. Alanna Kennedy and Courtney Niemiec are among the candidates to partner Abby Dahlkemper. 1) Alyssa Naeher – made several impressive saves to earn her fourth straight clean sheet and help the Red Stars to a scoreless draw against FC Kansas City; 2) Christine Nairn – A force in midfield for the Spirit in their 1-0 victory over the Dash; 3) Desiree Scott – Broke up numerous Red Stars attacks in her best performance of the season, something the Blues will need more of going forward. Also considered: Lydia Williams was hung out to dry of the Spirit goal and made a series of wonderful saves in the second half to keep the Dash in touch with the match; Kim Little was her usual, wonderful self for the Reign and looked ready to find a winner before time expired on her. -I’ll let you folks have your say about the referees down in the comment section. But I will say that Abby Ercegg was sent off for reasons that are beyond me. Neither of her yellow cards were even close to bookable offenses. -Erica Skroski has been rock solid in the back for Sky Blue. She has a nose for the ball and a calmness that cannot be taught. It looks like she was a 3rd round steal and has to be in the discussion of the rest rookies over the first quarter of the season. -With Erin McLeod out, Canada coach John Herdman has to be pleased with the way Stephanie Labbe and Sabrina D’Angelo are playing. Look for Labbe to start in Rio, but more importantly they are both gaining invaluable experience and thriving in it.